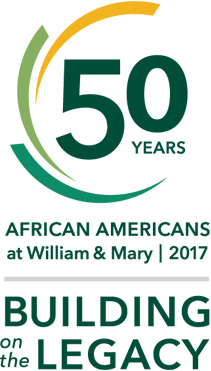 As part of the kickoff to William & Mary’s yearlong 50th anniversary commemoration of its first African-American residential students, class members including students, faculty, alumni and community members created the mural. The piece, to be unveiled at a ceremony in August, will be included in the W&M President’s Collection of Art and permanently displayed in Swem Library. The mural consists of painting, bronze masks and woodcuts. Every morning for three weeks this July, visiting artist Steve Prince explained parts of the process, and students in the “Workshop on Black Expressive Culture” course meeting in Andrews Hall went to work on them. He infused meaning into each step, encouraging students to think about the relevance of what they were doing. Each mask would be a part of the foundation for the piece, Prince said. He suggested they consider incorporating their ethnic history and genealogy, the meanings of their names, W&M history and the themes of going forward while looking back when choosing additions for their masks. “Each person is a seed for the future as it relates to this institution, as it relates to this nation,” Prince said. On July 13, the three women who were the first African-American residential students at W&M as freshmen in 1967 came to the class to have their masks made. Prince led a discussion as Lynn Briley ‘71, Karen Ely ‘71 and Janet Brown Strafer ’71 answered questions about their time as students and talked with those present. Then each student in the class participated in taking turns to put the plaster strips on the three women’s faces and capture their likenesses to be included in the mural. Briley, shaking her head in amazement as she wiped residual plaster off of her face, said she had never thought about being commemorated in such a way. Christine Fulgham ’17 said participating in the class was important to her because the mural project will honor the three women who paved the way for African-American students who came after them. After students completed their masks, Prince threw in a twist — they had to pair with someone in the class that they didn’t know, and combine their masks into one. The combinations were of all varieties as participants ranged in age from 19 to 70 and across the racial, gender and life-experience spectrum. The pairs would then work together throughout the process, sharing and using teamwork on each phase as they got to know each other extremely well. “It’s been such a gift to work with these students and faculty,” said Leah Glenn, associate professor and director of dance. Although she was out of her comfort zone, she said she got totally immersed in the project and its relationship-building atmosphere in working on something significant to the university’s history. “This class has been such an amazing experience, I think for everybody,” said Glenn’s mask partner Jayne Barnard, Cutler Professor & Kelly Professor of Teaching Excellence Emerita at W&M Law School. She pointed out the intricate teamwork of the disparate pairs, and that she and Glenn were two faculty members teaming together completely outside their areas of expertise. The likenesses were made from plaster first, then filled with wax to make a mask that students could add onto. That finished product, after several more steps, would be cast in bronze. Among the items adorning masks were lace, a cicada, a pearl, nails, a beak, spikes around the outside edge forming a lion’s mane and laurel leaves. One includes the sankofa bird in the shape of a tree branch. The theme for the 50th commemoration is sankofa, which, in the Akan Language of West Africa, reflects the idea that "it is not taboo to go back and fetch what you forgot." The double mask made by students DeLauren Davis ‘18 and Megan Sidlo ‘20 includes symbols representing the meanings of both of their names, the W&M Griffin and the sankofa bird among other things. One face has eyes open, while the other has eyes covered by laurel leaves. “It’s about moving forward, but also recognizing the past and its faults and things you can grow from,” Sidlo said. Fulgham and Bob Leek, a local potter active in the Williamsburg Area Arts Commission, made their mask half of her face and half of his, choosing the features they liked best, which were his nose and her lips. A blindfold over the eyes is one of its symbols, and the mask is sewn together diagonally. Leek said the class appealed to him because it fit with his passions for creating and the arts, as well as history. Each day’s tasks carried meaning in the class as participants plastered, molded and then, after casting, hammered and chipped at their masks while music flowed throughout and stories were shared. Painting on the mural and woodcutting went on simultaneously, and work was ongoing in the afternoons and evenings as the three weeks wound down. A constant reminder of the past was created by experiencing the beauty that can be created by working together, according to Prince. Chief Diversity Officer Chon Glover joins others in making molds of their faces as part of a mural project for the commemoration of the 50th anniversary of W&M's first residential African-American students.